1Phytopathology and Agricultural Zoology Research Unit, Department of Plant Protection, Faculty of Agronomy and Agricultural Science, P. O. Box 222 Dschang, University of Dschang, Cameroon. 2Biosciences Eastern and Central Africa-International Livestock Research Institute (BecA-ILRI) Hub, P. O. Box 30709-00100, Nairobi, Kenya. 3Applied Botany Research Unit, Department of Plant Biology, Faculty of Sciences, University of Dschang, P. O. Box 67 Dschang, Cameroon. 4Department of Agriculture and Veterinary Medicine, Université des Montagnes, P. O. Box 208, Bangangté, Cameroon. 5Microbiology and Antimicrobials Substances Research Unit, Department of Biochemistry, Faculty of Sciences, University of Dschang, P. O. Box 67 Dschang, Cameroon. *To whom correspondence should be addressed. E-mail: jdjeugapfovo@yahoo.fr, joseph.djeugap-fovo.1@ulaval.ca. Received 19 July, 2017; Received in revised form 17 August, 2017; Accepted 21 August, 2017. Antifungal activity, ITS sequences, Monodora myristica, Pathogenicity, Plant extracts, Post-harvest fungi. Identification of fungi from calabash nutmeg kernels was based on their morphological characteristics and analysis of the internal transcribed spacer (ITS) sequences of their genomic DNA. Antifungal activity of aqueous, methanolic and ethanolic extracts of four plants species (Azadirachta indica, Citrus sinensis, Moringa oleifera and Tithonia diversifolia) was tested in vitro at 50, 75, 100 and 125 mg/ml for aqueous extracts and 40, 60, 80 and 100 mg/ml for methanolic and ethanolic extracts. Mancozeb (1 mg/ml) and distilled water were used as positive and negative controls, respectively. The most frequently isolated fungi were Cercospora purpurea (34.28%), Fusarium oxysporum (23.81%) and Aspergillus flavus (17.14%). C. purpurea and F. oxysporum isolates were more aggressive after inoculation on healthy kernels. All the extracts tested, inhibited the growth of the fungi compared to the negative control, except the aqueous extract of T. diversifolia against C. purpurea and F. oxysporum and the methanolic extract of M. oleifera against F. oxysporum at 75 mg/ml. The efficiency of aqueous extracts of M. oleifera and C. sinensis was significantly lower (P<0.05) as compared to the reference fungicide on growth of A. niger at 125 mg/ml. Antifungal activity of methanolic extracts of A. indica, C. sinensis and T. diversifolia as well as ethanolic extracts of A. indica and M. oleifera was significantly equal to mancozeb at 100 mg/ml on A. flavus. 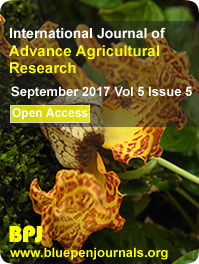 Aqueous extracts of M. oleifera and methanolic extracts of A. indica and C. sinensis could be used for protection of Monodora myristica kernels against post-harvest fungi. © 2017 BluePen Journals Ltd.